On May 26, 2012, we published a post titled “Unseen.” It said Northern Flickers hadn’t been noticed much around here recently. 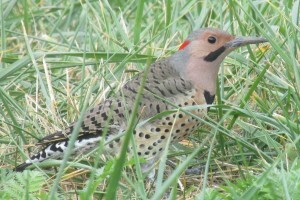 Separately, people who saw a Flicker and weren’t sure what kind of bird it was, went online to search for a picture that could help them identify it. They found our post with its photo, and the bird’s name. Many sent us a comment to let us know. Seems Flickers weren’t “unseen” everywhere. It’s normal for a post to get a few comments, but “Unseen” generated an uncanny number. Close to a hundred at last count. And they still come in. Some in response to that 2012 post, and some to the one you’re reading now. Flickers are out there, even though experts have reported they’re declining. Well, they’re not declining on this site. Here’s another picture. Ray and Barbara from North Adams, Massachusetts were nice enough to send it. Flickers may be scarce in our neck of the woods, but they’re still spotted. This entry was posted on Thursday, October 2nd, 2014 at 7:33 am	and is filed under "Daily Sightings" A Blog. You can follow any responses to this entry through the RSS 2.0 feed. You can skip to the end and leave a response. Pinging is currently not allowed.